Prior fracture is a strong predictor of subsequent fracture; however, postfracture treatment rates are low. Quantifying imminent (12–24 month) risk of subsequent fracture in older women may clarify the need for early postfracture management. This retrospective cohort study used Medicare administrative claims data. Women ≥ 65 years who sustained a clinical fracture (clinical vertebral and nonvertebral fracture; index date) and were continuously enrolled for 1-year pre-index and ≥ 1-year (≥ 2 or ≥ 5 years for outcomes at those time points) post-index were included. Cumulative incidence of subsequent fracture was calculated from 30 days post-index to 1, 2, and 5 years post-index. For appendicular fractures, only those requiring hospitalization or surgical repair were counted. Death was considered a competing risk. Among 377,561 women (210,621 and 10,969 for 2- and 5-year outcomes), cumulative risk of subsequent fracture was 10%, 18%, and 31% at 1, 2, and 5 years post-index, respectively. Among women age 65–74 years with initial clinical vertebral, hip, pelvis, femur, or clavicle fractures and all women ≥ 75 years regardless of initial fracture site (except ankle and tibia/fibula), 7–14% fractured again within 1 year depending on initial fracture site; risk rose to 15–26% within 2 years and 28–42% within 5 years. Risk of subsequent hip fracture exceeded 3% within 5 years in all women studied, except those < 75 years with an initial tibia/fibula or ankle fracture. We observed a high and early risk of subsequent fracture following a broad array of initial fractures. Timely management with consideration of pharmacotherapy is warranted in older women following all fracture types evaluated. The online version of this article ( https://doi.org/10.1007/s00198-018-4732-1) contains supplementary material, which is available to authorized users. Osteoporosis results in approximately nine million fractures annually worldwide , an estimate that is projected to increase as the population ages. Fractures occur more commonly and at earlier ages among women than men. 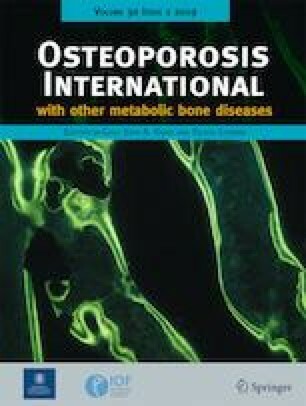 Osteoporotic fractures are associated with increased mortality, disability, and long-term decrements in function [2, 3, 4]. Osteoporosis treatment rates are low following fracture in postmenopausal women [5, 6], despite a fracture increasing the risk of fracturing again [7, 8]. In fact, a recent fracture is among the top predictors of future osteoporotic fracture and has been recognized in expanded criteria for the diagnosis and treatment of osteoporosis. The expanded criteria include hip or vertebral fractures regardless of bone mineral density (BMD) and low bone mass with a history of other low-trauma fractures and/or increased fracture risk as assessed through the Fracture Risk Assessment Tool (FRAX®) [7, 9, 10]. Although it is recognized that older women who have fractured are at increased risk of fracturing again, the magnitude of this risk and the contribution of other clinical risk factors are less understood. Studies indicate that the risk is greatest immediately after the initial fracture [11, 12], and the skeletal location of the initial fracture may also influence the magnitude of subsequent fracture risk [7, 13]. Fracture risk prediction tools such as FRAX® [14, 15] incorporate previous fracture and parental hip fracture, but do not predict imminent (12- to 24-month) fracture risk and make no distinction between the types of prior fracture. 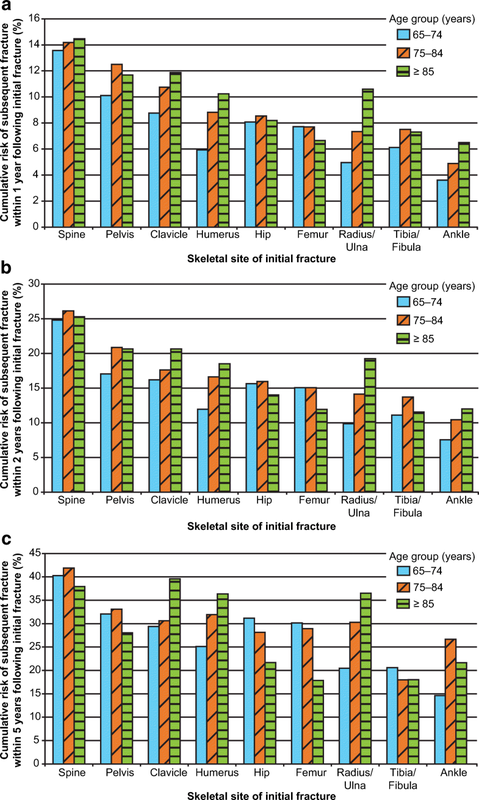 Utilizing data from over 350,000 US women with incident clinical fractures (clinical vertebral and nonvertebral fractures), we aimed to quantify the cumulative incidence of subsequent fracture at specific time points following initial (index) fracture, and assess the impacts of age, skeletal site of initial fracture, and other patient characteristics on subsequent fracture risk. Medicare, a US public health plan, covers > 90% of residents age ≥ 65 years. This retrospective cohort study used Medicare administrative claims data. We had access to the national Medicare random 5% sample for years 2006 through 2009 and all women (i.e., 100% of the data) with fracture in the years 2010 through 2012. Patients eligible for inclusion were women age ≥ 65 years with an incident clinical fracture at any skeletal site except the skull, face, fingers, toes, patella, sternum, scapula, or ribs. These fractures were excluded as they may have been due to trauma; these may also be challenging to accurately ascertain from claims data . In addition to clinical vertebral fractures, the nonvertebral fractures investigated in our study correspond to nonvertebral fractures assessed in previous clinical trials for osteoporosis pharmacotherapy . The fracture date was defined as the index date. Women were required to be continuously enrolled for 1 year pre-index and ≥ 1 year post-index in fee-for-service Medicare Parts A, B, and D, i.e., plans covering inpatient, outpatient, and prescription drug benefits. Part D eligibility was required for assessment of baseline medication use in patient characterization and prediction modeling analyses. Approximately 53% of Medicare beneficiaries were enrolled in Part D prescription drug plans in 2006, which increased to approximately 72% in 2012 . Women included in the 2- and 5-year analyses were required to fulfill the same eligibility criteria as those in the 1-year analyses, with the additional requirement of follow-up of ≥ 2 and ≥ 5 years post-index, respectively. Fulfillment of this latter requirement necessitated having initial fractures in earlier study years, allowing for sufficient follow-up. As the analytic file for earlier years was derived from the 5% random file, rather than the 100% osteoporosis file as in later years, the sample sizes of patients available for 2- and 5-year analyses were smaller than for the 1-year analyses. Thus, within each of the three cohorts, all patients contributed the entirety of the 1-, 2-, and 5-year follow-up periods, unless they died. Women who died during follow-up were recorded up to death and were not required to fulfill this post-index enrollment criterion. Women with claims indicating hospice care during 12 months pre-index, cancer or Paget’s disease pre-index (all available data), or hospice claims or died within 30 days post-index were excluded. Starting follow-up 30 days after the incident fracture enabled assessment of patients at a time frame when they might present to a healthcare provider for osteoporosis management and accommodated the definition of subsequent fracture (described below). Eligible initial and subsequent fractures included closed clinical fractures at any skeletal site except those listed above, identified using algorithms based on the presence of fracture diagnosis codes and relevant surgical repair codes (Supplemental Methods). We used algorithms similar to previous studies to identify incident fractures , some of which have been validated against clinical records and shown reasonable performance characteristics [20, 21]. To maximize the specificity of fractures and the validity of identifying subsequent fractures at the same skeletal site, fractures were required to be either hospitalized or surgically repaired. Clinical vertebral fractures with evidence of recent spine imaging were included in the absence of hospitalization or surgical repair . To capture fractures occurring from distinct fracture events, sequential claims for fractures had to be separated by a time-varying “clean period” of ≥ 30 days (≥ 90 days for fractures occurring at the same skeletal site, based on a rolling window), during which there was no fracture diagnosis code or fracture aftercare code. Fracture claims at distinct skeletal sites occurring < 30 days apart were considered as a single fracture event involving multiple skeletal sites (e.g., a fall, resulting in both a hip and wrist fractures). 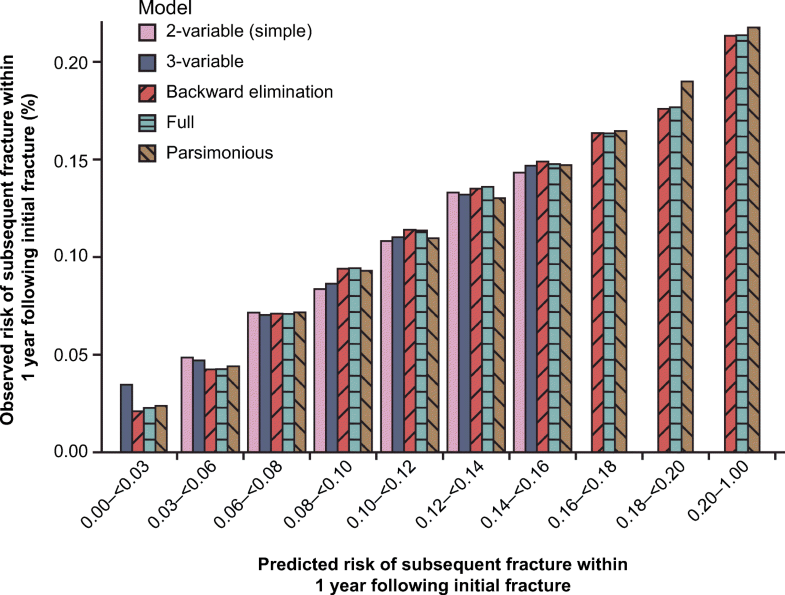 Based upon ongoing work, the positive predictive values of our algorithms for initial and subsequent fractures exceed 80–90% at all fracture sites . For identification of recurrent fractures at the same skeletal site, we evaluated alternate “clean periods” other than 90 days (e.g., 30, 60, 180 days). We found that PPV and sensitivity for identifying recurrent nonvertebral fractures were similar across clean periods ranging between 30 and 90 days. For identifying recurrent clinical vertebral fractures, the 90-day clean period yielded lower sensitivity than shorter clean periods. We adopted the conservative approach of using a 90-day clean period in this study. We estimated the cumulative incidence of any subsequent clinical fracture and subsequent hip fracture as the proportion of women experiencing these outcomes within 1, 2, and 5 years post-index. We further assessed time to subsequent clinical fracture using the cumulative incidence function in patients with ≥ 5 years of follow-up. In all analyses, time at risk for subsequent fracture began 30 days following the initial (index) fracture date and continued until the subsequent fracture, patient death, or end of enrollment. Death was considered a competing risk; patients who died following a subsequent fracture were classified as having both outcomes. Analyses were conducted in the overall study sample and stratified by patient age and skeletal site of initial fracture. If the initial fracture event involved multiple skeletal sites, we avoided double counting by assigning to one site using the following hierarchy, grouped to approximate the expected order of fracture severity: hip, femur, pelvis, clinical vertebral, humerus, radius/ulna, tibia/fibula, ankle, and clavicle. We evaluated the impact of baseline characteristics, including patient age group, race, skeletal site of initial fracture, comorbidities, medication use, and healthcare utilization during 12 months pre-index (based on ≥ 1 physician diagnosis code [International Classification of Diseases, 9th Revision; ICD-9] and filled prescriptions for medications of interest [described fully in Table 4, ICD-9 codes available on request]), on risk of subsequent clinical fracture using separate models for 1-, 2-, and 5-year endpoints. Fall risk was calculated based on a 1-year baseline and included an accidental fall or a score of ≥ 2 using the validated Falls Risk Assessment Tool (FRAT) adapted for use with administrative claims data . Logistic regression was used given that the occurrence of a fracture event at any time during the 1-, 2-, and 5-year observation periods was the event of interest, and the timing of when the fracture occurred within these intervals was less important. To understand whether a simpler prediction model could perform well in population-level risk stratification for subsequent fracture, we used a “fully saturated” model (full model) including all covariates of interest, selected based on domain expertise, and then evaluated a series of progressively simpler models, including a model derived by stepwise backward elimination from the full model; a “parsimonious” model with fewer variables clinically selected based on their strong associations with fracture risk previously documented in the literature (age group, race, skeletal site of initial fracture, single vs multiple fractures at index, fall risk, chronic obstructive pulmonary disease [COPD], obesity, and glucocorticoid use); a three-variable model (age group, race, and skeletal site of initial fracture); and a two-variable simple model (age group and skeletal site of initial fracture). 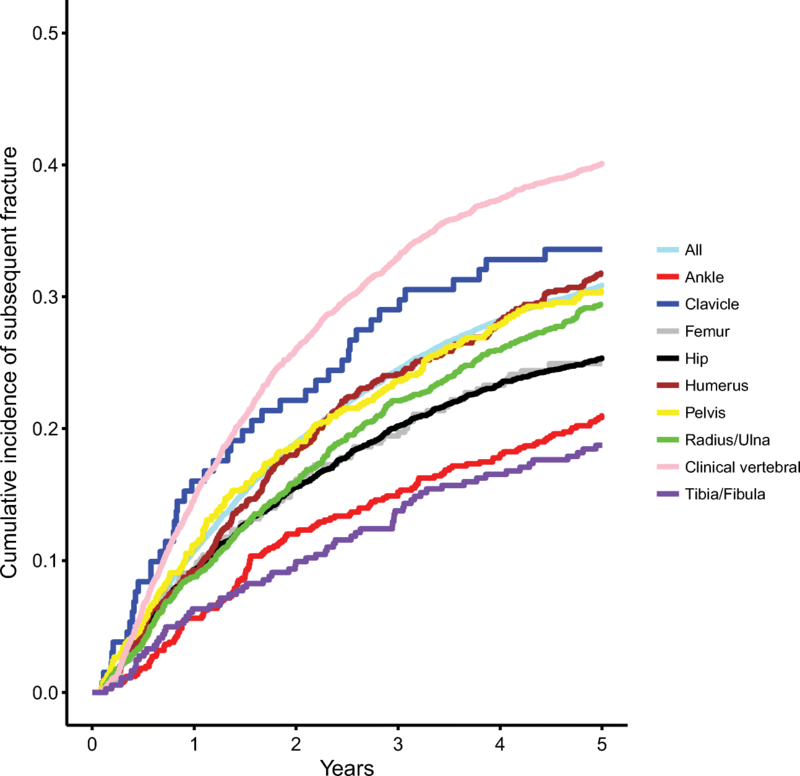 Subgroup analysis was undertaken to assess whether individual comorbidities influenced the 1-, 2-, or 5-year outcomes in the oldest age group (≥ 85 years) in the full model. For all models, we assessed model discrimination by computing the area under the receiver operator curve (AUC) or c-statistic, and model calibration by comparing predicted to observed risks of subsequent fractures visually (approximating deciles of risk). Statistical analyses were performed using SAS 9.4 (SAS Institute). Among the 11,431,308 Medicare beneficiaries with fracture in the data sample, 377,561 women with incident clinical fractures met all eligibility criteria for assessment of 1-year risk of subsequent fracture (Supplemental Fig. 1). Of these, 210,621 and 10,969 women had sufficient follow-up for assessment of 2- and 5-year risks, respectively. (The reduced sample size for 5-year follow-up reflected the smaller size of the source data file for earlier study years, the 5% Medicare random sample, as explained in the “Materials and methods” section.) Women included in the 1-year analysis had a median age of 81 years, and 87% were white. Women with initial hip fractures were more likely to be older, with more comorbidities and a higher risk of mortality than women with other initial fracture locations (Table 1). Women included in the 2- and 5-year analyses had similar baseline characteristics to the 1-year study cohort (data not shown). Overall, 10%, 18%, and 31% of women fractured again within 1, 2, and 5 years, respectively, following their initial clinical fracture when considering all initial fractures regardless of fracture site (Table 2). From the time of their initial fracture, the risk of subsequent fracture decreased over time; 35% of subsequent fractures occurred within the first year of the 5-year follow-up after the initial fracture (Fig. 1). Among women age 65–74 years, 14% experienced a clinical fracture within 1 year following an initial clinical vertebral fracture; 0% within 1 year following hip, pelvis, femur, or clavicle fracture; and 5–6% within 1 year following initial fracture at other sites except ankle (Fig. 2; Supplemental Table 1). Five-year risk in this 65- to 74-year-old age group exceeded 20% following initial fracture at all sites except ankle. The risk of subsequent fracture increased with age group at all time points following radius/ulna, clavicle, and humerus fractures. Conversely, there was little variability by age in the risk of subsequent fracture for women with initial hip or femur fracture, except at 5 years where the risk was lower in women ≥ 85 years (Fig. 2; Supplemental Table 1). Among women ≥ 75 years, the risk of subsequent fracture was 7–12% within 1 year, 15–20% within 2 years, and 28–33% within 5 years following most fracture types. Risks were highest following clinical vertebral fracture, with 1- and 2-year risks of 14% and 26%, respectively, in women ≥ 75 years. The 5-year risk of subsequent fracture after an initial clinical vertebral fracture for women 75–84 years was 42% and was comparable to that among women ≥ 85 years (38%) (Supplemental Table 1). The risk of hip fracture within 1, 2, and 5 years following any clinical fracture was 2.4%, 4.8%, and 10.2%, respectively. In stratified analyses, the risk of hip fracture within 1, 2, and 5 years following an initial clinical fracture was 1.4%, 2.9%, and 6.8%, respectively, among women 65–74 years; 2.3%, 4.8%, and 10.5%, respectively, among women 75–84 years; and 3.3%, 6.1%, and 11.5%, respectively, among women ≥ 85 years (Supplemental Table 1). The risk of subsequent hip fracture exceeded 3% within 5 years in all postfracture women, except women 65–74 years with initial tibia/fibula fractures where risk was slightly lower (2.9%) and women 65–74 years with initial ankle fractures (2.4%). In many subgroups, this risk level was observed early following the initial fracture and continued to increase over follow-up. For example, in women age ≥ 75 years with initial clinical vertebral, pelvis, or clavicle fractures, 1-year risk of hip fracture was ≥ 3%. In women of all age groups with initial clinical vertebral, pelvis, clavicle, hip, or femur fractures, and women age ≥ 75 years with initial humerus, radius/ulna, or tibia/fibula fractures, risk of subsequent hip fracture within 2 years was ≥ 3%. Mortality rates within 1, 2, and 5 years following initial fracture were 19%, 31%, and 64%, respectively, following hip fractures and 14%, 24%, and 54%, respectively, following clinical vertebral fractures (Table 3). Baseline characteristics that influenced 1-year risk of subsequent fracture by > 20% in the full model included age group, race, skeletal location of initial fracture, history of fractures, history of nervous system disorders, certain comorbidities, benzodiazepine use, and tobacco use (Table 4). The adjusted 1-year risk of subsequent fracture was 22% greater among women 75–84 years (odds ratio [OR] = 1.22, 95% confidence interval [CI] 1.18–1.26) and 30% greater among women ≥ 85 years (OR = 1.30, 95% CI 1.25–1.35), compared to those 65–74 years. Compared to women with an initial hip fracture, adjusted 1-year risk of subsequent fracture was greater in women with initial clinical vertebral (OR = 1.78, 95% CI 1.72–1.84), pelvis (OR = 1.40, 95% CI 1.33–1.47), clavicle (OR = 1.36, 95% CI 1.23–1.51), or humerus (OR = 1.10, 95% CI 1.05–1.16) fractures; comparable in women with initial radius/ulna fractures (OR = 0.99, 95% CI 0.94–1.04); slightly reduced in women with initial femur (OR = 0.90, 95% CI 0.83–0.97) or tibia/fibula fractures (OR = 0.89, 95% CI 0.82–0.96), and lower for women with an initial ankle fracture (OR = 0.63, 95% CI 0.59–0.67). Findings from the backward elimination model were similar. Results were similar for 2- and 5-year risks (data not shown). In the subgroup analysis among women age ≥ 85 years, analysis of over 30 comorbidities indicated that only baseline diagnoses of osteoporosis and weakness had statistically significant effect sizes at each time point in this age group (data not shown). Use of benzodiazepines, use of proton pump inhibitors, and COPD were significant at some but not all time points. Further, factors that were associated with risk of subsequent fracture in our original model, such as skeletal site of index fracture and history of baseline fractures, remained key predictors in the subgroup of women age ≥ 85 years. All prediction models showed good calibration; visual inspection showed that the observed 1-year fracture risks agreed closely with predicted risks across the distribution of predicted risk (Fig. 3). The AUC ranged between 0.61 and 0.64 across models, suggesting that discrimination was similar across models. In general, the simpler two- and three-variable prediction models were well calibrated, although failed to assign patients to the lowest and several highest risk categories. Similar results were seen regarding the relative performance of models predicting 2- and 5-year risks of subsequent fracture (data not shown). In this study of over 350,000 older US women with fracture, imminent (12- to 24-month) risk of subsequent fracture was high despite accounting for competing mortality risk. Patient age and skeletal site of initial fracture strongly influenced the magnitude of subsequent fracture risk, and a simple model that included only these two factors performed reasonably well in estimating subsequent fracture risk compared with more complex prediction models. Overall, among women age ≥ 65 years with a clinical fracture, a subsequent clinical fracture occurred in 10% within 1 year, 18% within 2 years, and 31% within 5 years following initial fracture. In recent years, osteoporosis management guidelines have incorporated fractures into the diagnosis and treatment criteria. Pharmacotherapy is recommended for postmenopausal women with hip and vertebral fractures regardless of BMD . The high proportion of women with clinical vertebral fractures who sustained a subsequent fracture in our study (25% risk at 2 years, 40% risk at 5 years) supports these recommendations and highlights the importance of being vigilant to vertebral fractures in postmenopausal women. Furthermore, several nonhip fracture locations conferred comparable or greater subsequent fracture risk than the 8%, 15%, and 25% risks (at 1, 2, and 5 years, respectively) associated with initial hip fractures. Comparable or greater fracture risk to hip fracture was seen in women < 75 years with initial clinical vertebral, clavicle, pelvis, or femur fractures, and women ≥ 75 years with initial fracture at all skeletal sites evaluated except ankle and tibia/fibula, where risk was lower. These findings were supported by our multivariable models. 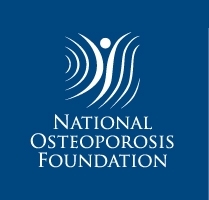 Osteoporosis pharmacotherapy is currently also recommended for women with low bone mass if their FRAX®-based 10-year predicted risk meets or exceeds 20% for major osteoporotic fracture or 3% for hip fracture [7, 9]. In our study, > 3% risk of hip fracture was observed within 5 years following all initial fracture types in women across all age groups, except for women 65–74 years with initial tibia/fibula or ankle fractures. Several subgroups of women in both older and younger age groups met this risk threshold within 2 years following initial fracture. On the basis of these analyses, all women > 65 years with an incident fracture of the types studied, except women between 65 and 75 years with ankle or tibia/fibula fractures, would be expected to have fracture risk comparable to or exceeding the predicted risk threshold considered for treatment within clinical guidelines. There is strong evidence from clinical trials for the benefit of osteoporotic treatment in patients with prior vertebral fracture or a prior hip fracture regardless of BMD [25, 26, 27]. In addition, it has been shown for a number of currently approved treatments that their efficacy varies minimally across a wide range of 10-year fracture risk scores determined by FRAX® [28, 29, 30], especially when the risk is at or above the previously mentioned intervention thresholds . These findings, while highly suggestive of a benefit of pharmacological treatment in high-risk patients, even when their BMD is unknown, would certainly benefit from further confirmation through prospective studies to confirm these recommendations. Our findings are consistent with previous studies evaluating long-term fracture risk [32, 33, 34, 35, 36]. A large UK population-based study reported that subsequent fracture risk is increased following various initial fracture types , with 34% risk observed at 5 years following vertebral fracture among women ≥ 65 years. In a population-based study in Norway, all fracture sites other than ankle and hand were associated with increased subsequent fracture risk. Among women ≥ 50 years, the age-adjusted incidence rates of subsequent fracture were 1.3- to 1.6-fold greater than incidence rates of initial fracture, depending on initial fracture site . In the Global Study of Osteoporosis in Women, nine of 10 fracture sites conferred increased fracture risk, with prior fracture conferring approximately twofold increased risk of any future fracture . This relative risk varied by fracture location, with a sevenfold increased risk of vertebral fracture among women with prior vertebral fracture. Consistent with our findings, the proportions of women with an initial fracture who fractured again increased with age in these studies. A recent study of US Medicare beneficiaries evaluated the risk of subsequent hip, shoulder, or wrist fracture within 1 year following initial fracture at these sites . The magnitude of subsequent fracture risk was similar across the three initial fracture types but varied by patient age and comorbidity score, ranging between 2.5 and 9.4% among women age > 65 years . The lower risk observed as compared with our study likely reflects the fewer fracture sites (only these three) included in their study outcome. Studies have also reported that subsequent fracture risk was disproportionately high in the early period following initial fracture [11, 38]. In a study of 1918 patients with initial hip, spine, or shoulder fractures, 31–45% of subsequent fractures occurred within the first year of a 5-year follow-up . Van Geel et al. reported that the relative risk of subsequent fracture was 5.3 within 1 year, 2.8 within 2–5 years, and 1.4 within 6–10 years . Based on previous studies [8, 40, 41], an increased subsequent fracture risk among women with previous fractures appears to be independent of BMD (not evaluable in our study). In the Manitoba Bone Density Program, compared to women without prior fracture, those with prior fracture had a 1.4- to 2.0-fold greater risk (depending on initial fracture site) of major osteoporotic fracture after accounting for age and BMD . In the Dubbo Osteoporosis Epidemiology Study, compared to the risk of an initial fracture, the risk of subsequent fracture increased by twofold in women with nonosteoporotic BMD and threefold in women with osteoporotic BMD . Approximately 39% of subsequent fractures in women were estimated to occur in patients with normal or low bone mass. A meta-analysis of 11 international cohorts reported that low BMD explained 8% of the subsequent fracture risk among patients with previous fracture . Conducting this study within the Medicare-insured population, including a 100% sample of women with fracture for recent years, provided a large and representative patient population of older women, and our findings are likely generalizable to other populations. Previous studies in the USA and the UK reported similar rates of subsequent fracture [32, 34, 36]. The database provided information on many risk factors, and our analyses adjusted for the competing risk of mortality. However, the use of administrative claims data posed certain limitations. Clinical outcomes such as fractures might have been captured with lower accuracy compared with other data sources, especially in the identification of vertebral fractures. Vertebral fractures are often undiagnosed, since patients may not seek medical attention, and thus may not appear in claims (or electronic health records) data sources . Furthermore, distinguishing claims for incident vs previous fractures can also be challenging. We reduced the likelihood of false-positive outcomes by requiring all nonvertebral fractures to be hospitalized or surgically repaired, and avoided misclassifying existing fractures as incident cases by applying minimum clean periods between fracture claims. For this reason, our estimates of fracture risk are conservative and likely represent a modest underestimate, especially for fracture sites (e.g., wrist/forearm) that often do not require hospitalization or surgical repair. We cannot eliminate the possibility of misclassifying follow-up for a prevalent fracture as a new incident fracture at the same site, in spite of our use of a washout period to minimize this issue and giving high weight to surgical repair or hospitalization to improve specificity in the fracture identification algorithm. The claims data lacked information on certain known predictors of fracture, including BMD and body mass index. However, these factors may be less critical in this study of women with a recent fracture, as known predictors of first-time events often show smaller effects on recurrent events [19, 43]. In summary, this nationwide study demonstrated an early and high risk of subsequent fracture among older women who fracture across a range of initial fracture sites, even after accounting for the risk of death. Irrespective of the site of initial fracture, women in all age groups studied had fracture risk comparable to or exceeding the predicted risk thresholds considered for osteoporosis pharmacotherapy in US clinical guidelines, with the exception of women < 75 years with ankle or tibia/fibula fractures. Our findings highlight the need for timely management to reduce the risk of subsequent fractures among postmenopausal women who have already sustained a fracture. This project was funded by a contract between UAB and Amgen, Inc. UAB had full access tothe data. Amgen reviewed the publication, but UAB retained rights of final approval. The institutional review board of the University of Alabama at Birmingham approved the study. LC and SGD have nothing to disclose. JZ received research support from Amgen Inc. during the conduct of the study. AG and AB are employees of and hold stock in Amgen Inc. DW was an employee of, holds stock in, and has received consulting fees from Amgen Inc. JRC has received research grants and consulting fees from Amgen Inc. and Radius Health.